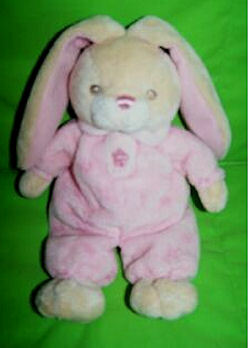 I’m looking for an Aurora Baby cream rabbit wearing a pink velour outfit with flowers on it. It measures approximately 10 inches long (not including the lop ears). My beautiful daughter that was 4 1/2 had 3 open heart surgeries. She went into heart failure and was waiting for a heart transplant. Last Memorial Day weekend of 2010, she had a stroke, paralyzing the right side of her body. On June 17th, 2010, my Kaydence passed away in my loving arms. She had a bunny just like this one, but pink. When she passed, her little bunny went with her in her casket. I would love to find this pink bunny. ebay # 180693768134 is the pink bear version of this plush. If you can use this one, let me know….I would be more than happy to help you. this one has been sold on ebay but at least everyone can have a picture of what the pink one looks like. Thanks, Brieanna. I’ve changed the photo, but it does say it sold. Thank you Rosemary, yes it is SOLD. 🙁 One day I will work out how to tell the difference!